Developing web apps is not an uphill task nowadays given the number of resources (read tools and technologies) that are available online and offline. 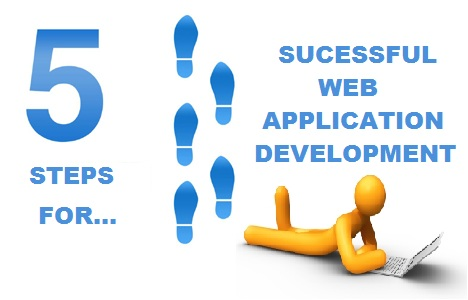 But one thing which is essential for developing any successful web application is a road-map. Think of your web application as a destination you need to reach after following certain directions; a road map is something that will help you reach this destination successfully. In order to develop a successful web app, you must first create a flawless road-map and stick to it till the end. From my own experience, I have made an easy-to-follow road-map of five steps for web developers. Take a look at them so that you too can develop successful web applications in an easy and clearly defined manner. Understanding your clients’ requirements is the first and foremost requirement for web development. For this you will have to sit with the clients and interact with them face-to-face and jot down what they want from the web app. Their requirements may be in terms of the features and functionality or the specific tasks that will be performed by the app, the main aim of the app et al; doing this will give you a head start for the web app development. Be it any kind of project, carrying out in-depth research is a must if you want to develop a successful web application. Spend a significant time in research, which may consist of knowing your target audience’s preferences, what kind of apps do maximum users look forward to, what category of apps do well in the market and so on and so forth. A tried and tested tip you must use for all your projects, is to break down the project into small parts. This is because it is easy to manage these small parts of the project rather than handling the entire project at once. This also means that the project will become easy for you to test since you would be testing one part at a time and will be able to focus better on the flaws. Settle for nothing but the best while developing any web app. For this, you must invest some extra time to polish your work. What I mean to say is check the project while developing it and see if you can enhance it some more. The best way to do this is to complete a module and then check it so that you don’t overshoot the time-frame in the process. The last step of developing a web app is to test your final output for errors. No matter for what platform you are developing the app, it must not freeze or crash when users run it on their devices as this will leave a bad impression on them. To ensure that there are no stray bugs in your app, I suggest that you go for both automated and manual testing turn-by-turn. These were basic steps of the road-map which will help you develop many successful web applications for your end users. Albert Vang is a Los Angeles based Web Application developer with PLAVEB and has worked on many Custom based Ecommerce shopping cart development projects. An avid reader, she also likes to write as a hobby and she pursues it by writing for various guest-blogging sites. Nice article and good points you discussed. But i would like to add You need to be aware of the phases of the development process in order to have a successful web application. First you must visualize your project and understand what the purpose of it is. Lay out your goals and plan what you need to do to achieve them. Next,making step one come together with details such as language, features, and give yourself a timeline and an estimated date the application should be finished. The next phase is the actual development of the web application where the developers develop codes to make your idea a reality. And the final step is testing your creation and getting out the glitches it may have endured.